Wife of the Governor State of Osun, Mrs Kafayat Oyetola has called on citizens of the state to flee vote selling habit, while urging them to come out enmass and vote for all candidates of the All Progressives Congress APC during the general elections. She said it is necessary for the people of the state to vote for President Muhammadu Buhari and other APC Candidates in the coming elections, adding that the party had done wonderfully in all ramifications building a new Nigeria. 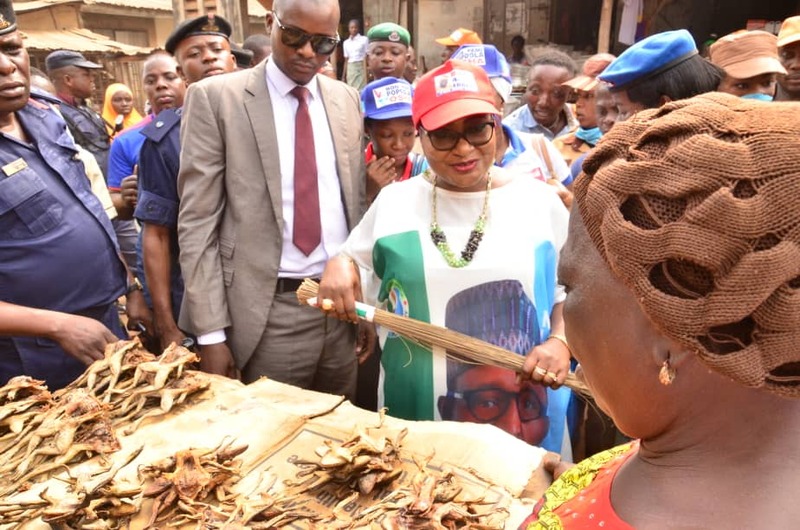 Mrs Oyetola made the call during her campaign tour to market places in the state. 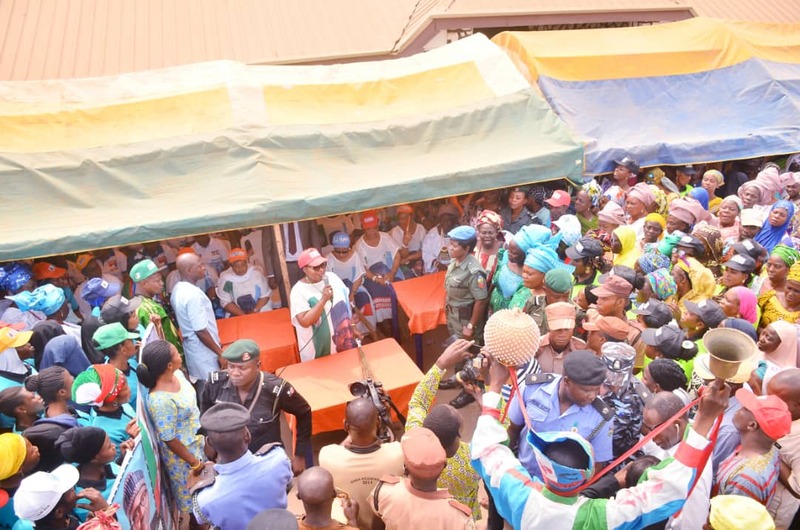 Among the markets the state's first lady visited in Osun State include; Oluode, Igbona, Oke Fia and Orisunbare market all in Osogbo. Alamisi in Ikirun, Osun market Iragbiji, Atakumosa market in Ilesha, Odo-Ori market Iwo, Olufi market Gbongan, Oja Obada Ikire and Ila Orangun. 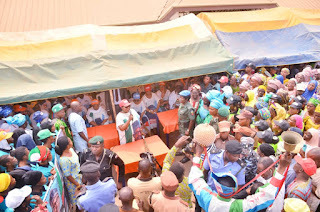 The wife of the Governor who commended the market men and women for supporting her husband during the last governorship election held in the state, enjoined the market men and women to fasten their belt to ensure their votes bring back President Buhari to power and other contestants in the party. 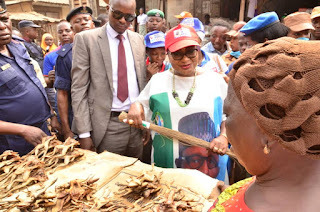 Mrs Oyetola also used the venue to educate the market men and women to make use of their index finger to cast their votes on the election day. Speaking at the market rally, the lawmaker representing Irewole, Ayedaade and Isokan Federal Constituency Hon. Ayo Omidiran urged the people to demonstrate good conduct during and after election. 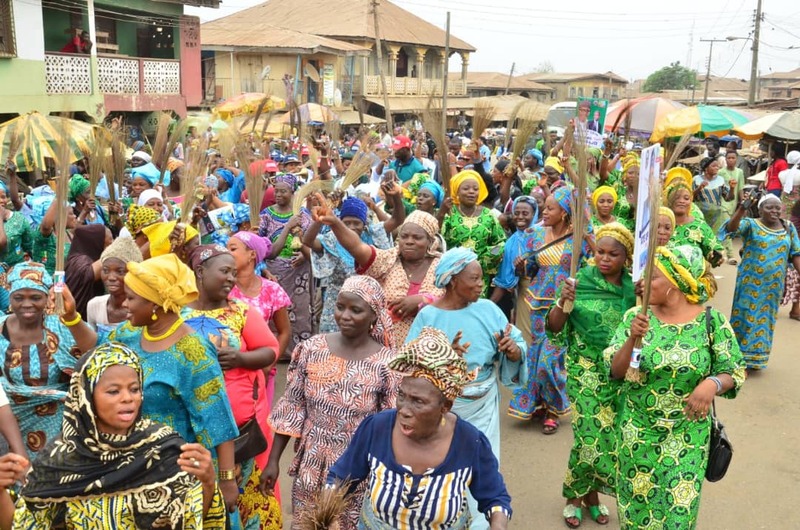 Also speaking, the Iyaloja general State of Osun, Alhaja Awawu Asindemade assured the first lady maximum support of the market men and women for all the party's candidates, adding that community mobilization and door to door campaign will be put in place to create more awareness to the people at the grassroot level. Earlier in their courtesy visit to the palace of Oluwo of Iwo Oba AbdulRasheed Akanbi, said all Yoruba race who love to continue to enjoy the dividends of democracy must ensure they vote for President Buhari. Oba AbdulRasheed gave kudos to APC led government in exhibiting the good legacy of late Chief Obafemi Awolowo through various developmental programmes the party had succeeded in throughout the nation.